RACER magazine has paved the way in motorsport coverage of Formula 1, IndyCar and Sports Cars with world-class writing and photography that tells the stories of racers in a way that is unlike any other publication. If you’re passionate about motorsports and insist on both style and substance, RACER is an essential read. We offer new subscribers a one-year Print + Digital subscription for only $39. That’s a savings of 27% off the cover price and $10 off our regular subscription rate. You can enjoy the luxury of our beautiful print edition plus access to RACER's convenient digital edition at this low introductory price for only a limited time. Don’t miss out — ORDER NOW! Just $9.99. Save 81% off the print edition cover price. All the same great content at a lower price. View a digital reproduction of the print edition on your desktop, with an HTML content option on mobile devices. 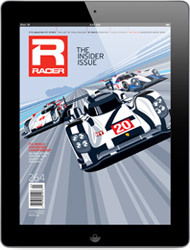 Explore current and back issues in the RACER Store. If you ever want to cancel your RACER subscription for any reason, just let us know and you’ll receive a full refund on any unserved issues. RACER magazine is an old-school analog product. It's printed by skilled American artisans in a factory with big machines with lots of moving parts. We import our paper from Finland. It's bright, smooth and heavy and it takes ink beautifully. RACER is expensive to make and expensive to mail, but we believe it's worth the extra cost to provide our customers with a product of permanence and beauty. It's not for everyone, but if you appreciate the heft and feel of a premium product, RACER magazine is an affordable luxury you should experience for yourself. “Anyone who loves motor racing like I do certainly looks forward to reading RACER. It’s simply impossible not to like it. It’s filled with all the up-to-date information readers would expect from an exceptional magazine.